Green is a color that is full of life and energy. When the grass and flowers re-emerge in the springtime and when the trees start growing leaves again, green can be seen all around us. Green is also the color that is best associated with natural and organic things. A green wedding theme is therefore most likely used for casual springtime weddings where the mood is romantic and laid back. A green wedding theme is best represented in the great outdoors. Having a wedding in a garden setting would be ideal for this particular theme. You and your guests will be surrounded by sprawling fields of grass, a variety of trees, and all kinds of beautiful flowers. Nature already does its part to create a gorgeous setting for your green theme, all you have to do is add a few more elements to really make it come alive. 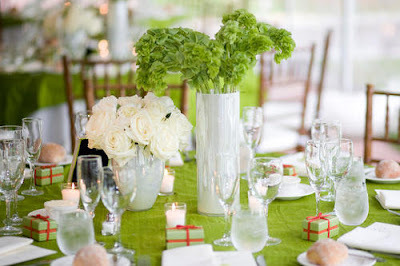 If you elect to have your wedding in one of the colder months, you can still make good use of the color green. Of course a green wedding theme in the fall or winter should consist of darker shades of green such as olive or hunter green as opposed to lighter shades such as mint or sage green that are better suited for the warmer months. Green is a color that can be used in combination with almost any other color, but for the purpose of this theme it's best to keep the other colors to a minimum. It's hard to find a bride wearing green from head to toe on her big wedding day, although it's not out of the question. There must be a small selection of pastel green wedding dresses available for those who wish to have one. If you are a bride who wants to stick with the traditional white dress, but would like to somehow incorporate a little bit of green into your look there are some fun options available. A light green silk sash around the waist is a great way to wear the color, so is having a floral head wreath. 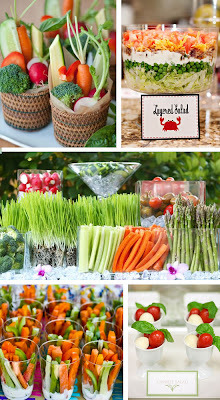 Food should be an important factor for a green wedding theme. Due to the color's organic and healthy symbolism, the ideal food to serve your guests are light meals with lots of fruits and vegetables. When settling on the menu options, do not pick out dishes that are too heavy or anything containing a lot of strong spices. Foods that are in season, close to nature and known for their freshness is your best bet. The rest of the decorations can be just about anything with a touch of green. Ideally for this theme, it's best to use reusable items. There are more and more couples that are into the green movement, they care about the environment and like to live an eco-friendly life. Their wedding will be different, decorations are not to be used once and then thrown away. Wedding favors are more thoughtful and sustainable as well. As a token of your appreciation, you can give your wedding guests seeds so they can grow their own beautiful flowers or plants.